Water is too precious of a resource to use just once. With advances in technology, recycled water has become a vital resource for non-drinking purposes and provides a sustainable water source that is reliable, economically feasible, and an environmentally sensitive means to maximizing water resources. The need for pure water is one of the world’s most enduring problems. An estimated 2 billion people worldwide do not have access to adequate sanitation and/or clean water. 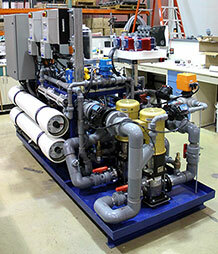 EVC offers clients a variety of innovative water recycling and purification solutions. Contact us to learn more. EVC’s Laundry Water Recycling System evolved from a system designed by its parent company, Concurrent Technologies Corporation (CTC). The original system was called SYLAS-R2® (System for Laundry and Shower Recycle/Reuse). SYLAS-R2® won a Silver Edison Award in the energy and sustainability category. 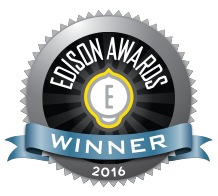 Since 1987, the Edison Awards™ have recognized and honored some of the most innovative new products, services, and business leaders in the world. EVC’s Twin Ultra™ Greywater Recycling System treats greywater from laundry, sink, showers, and other commercial and industrial sources and recycles the treated water for use in washing machines, showers, and other non-potable sanitary systems. This system fulfills greywater recycling needs in multiple markets, including the federal and local governments, military, industrial, commercial, mining, hospitality, multi-family residences, higher education, oil and gas, manufacturing, and disaster relief. Beyond the Twin Ultra™ product line, our Twin Ultra Plus™ adds a reverse osmosis module for laundries processing heavily soiled fabrics where high detergent and chemical use is required. Click here to download our Twin Ultra brochure. Click here to download the Twin Ultra Press Release. At EVC, we leverage research, development, test and evaluation work to produce transformative, full lifecycle, commercial solutions. In partnership with our parent company, we offer the complete ability to fully design, develop, test, prototype, and build customized solutions in support of our clients’ core mission objectives. 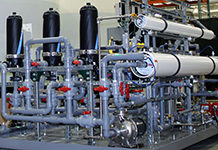 Our WET system enables EVC to optimize new state-of-the-art water technologies and perform worst case longevity testing for our clients’ unique needs. EVC’s ability to optimize systems before they’re delivered saves our clients time and money while ensuring performance.